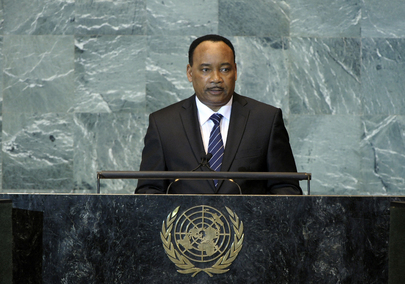 MAHAMADOU ISSOUFOU, President of Niger, said poor political and economic governance was the root of evil while inequality caused disorder, crisis and conflict. Noting that a minority of the world’s population owned most of its wealth, while its poorest people lived on less than $2 a day, he said that was a moral affront and economically inefficient, as it limited economic growth. Niger and other poor nations had suffered enormously under the misguided economic programmes of structural adjustment begun in the 1980s. Regrettably, rich nations had not made good on their commitments to provide official development assistance which, coupled with the global banking crisis and the lack of foreign direct investment (FDI) in Africa, had negatively affected the continent’s economies. Global balance required development in all regions and the creation of a powerful middle-class, he noted. Turning to developments in the Middle East, he said that in seeking recognition as a full United Nations Member State, the Palestinians had given the world body an opportunity to make a brave decision to resolve the question of Palestine in a definitive manner. Failure to make such a decision would amount to a failure to live up to the expectations of the Arab Spring and erase its gains. On terrorism, he said that the recent suicide attack on United Nations headquarters in Abuja showed that no region was safe from the menace. Niger faced the threat of terrorism on its northern border with Algeria, on its western border with Mali and on its southern border with Nigeria, he noted. He said his country was also grappling with the threat posed by traffickers of drugs and human beings, a situation exacerbated by the Libyan crisis. Weapons flowing throughout the Sahara-Sahel region could end up in the hands of terrorists, he warned, adding that Niger was committed to working with other countries in the subregion to address that possibility. He expressed hope for a rapid solution to the crisis in Libya, stressing that failure to resolve it would have negative security and socio-economic consequences for Niger, including an end to Libyan-funded infrastructure construction. As Nigerien migrants fled Libya, their country would receive them as well as Libyan refugees, in accordance with international law and standards, he pledged. Regarding environmental concerns, he pointed out that least developed countries produced just 1 per cent of greenhouse gases, but suffered constantly from climate change. Drought and flooding in the last decade illustrated the increase in extreme weather conditions, and to address it, the Government had increased irrigation and tried to protect the environment. However, the current crop season would suffer greatly, he said, renewing his appeal for international aid to prevent impending food insecurity. Niger was rich in resources such as uranium, gold, coal, cement and oil, he said, adding that the Government wished to use those resources to improve the socio-economic lot of its people. The country had joined the Extractive Industries Transparency Initiative, and intended to create tens of thousands of jobs for young people. It was also encouraging private investment and hammering out a law on public-private partnerships for the rapid mobilization of funding. He called for sweeping reform of international organizations, including the World Bank and IMF, as a prerequisite for global peace and stability.